This book presents a major innovation in the interest rate space. 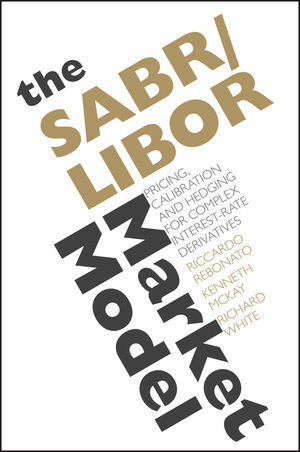 It explains a financially motivated extension of the LIBOR Market model which accurately reproduces the prices for plain vanilla hedging instruments (swaptions and caplets) of all strikes and maturities produced by the SABR model. The authors show how to accurately recover the whole of the SABR smile surface using their extension of the LIBOR market model. This is not just a new model, this is a new way of option pricing that takes into account the need to calibrate as accurately as possible to the plain vanilla reference hedging instruments and the need to obtain prices and hedges in reasonable time whilst reproducing a realistic future evolution of the smile surface. It removes the hard choice between accuracy and time because the framework that the authors provide reproduces today's market prices of plain vanilla options almost exactly and simultaneously gives a reasonable future evolution for the smile surface. The authors take the SABR model as the starting point for their extension of the LMM because it is a good model for European options. The problem, however with SABR is that it treats each European option in isolation and the processes for the various underlyings (forward and swap rates) do not talk to each other so it isn't obvious how to relate these processes into the dynamics of the whole yield curve. With this new model, the authors bring the dynamics of the various forward rates and stochastic volatilities under a single umbrella. To ensure the absence of arbitrage they derive drift adjustments to be applied to both the forward rates and their volatilities. When this is completed, complex derivatives that depend on the joint realisation of all relevant forward rates can now be priced. Riccardo Rebonato is Global Head of Market Risk and Global Head of the Quantitative Research Team at RBS. He is a visiting lecturer at Oxford University (Mathematical Finance) and adjunct professor at Imperial College (Tanaka Business School). He sits on the Board of Directors of ISDA and on the Board of Trustees for GARP. He is an editor for the International Journal of Theoretical and Applied Finance, for Applied Mathematical Finance, for the Journal of Risk and for the Journal of Risk Management in Financial Institutions. He holds doctorates in Nuclear Engineering and in Science of Materials/Solid State Physics. He was a research fellow in Physics at Corpus Christi College, Oxford, UK. Kenneth McKay is a PhD student at the London School of Economics following a first class honours degree in Mathematics and Economics from the LSE and an MPhil in Finance from Cambridge University. He has been working on interest rate derivative-related research with Riccardo Rebonato for the past year. Richard White holds a doctorate in Particle Physics from Imperial College London, and a first class honours degree in Physics from Oxford University. He held a Research Associate position at Imperial College before joining RBS in 2004 as a Quantitative Analyst. His research interests include option pricing with Levy Processes, Genetic Algorithms for portfolio optimisation, and Libor Market Models with stochastic volatility. He is currently taking a fortuitously timed sabbatical to pursue his joint passion for travel and scuba diving. 2. The LIBOR Market Model. 2.3 Separating the Correlation from the Volatility Term. 2.4 The Caplet-Pricing Condition Again. 2.6 Possible Shapes of the Doust Correlation Function. 2.7 The Covariance Integral Again. 3.1 The SABR Model (and Why It Is a Good Model. 3.2 Description of the Model. 3.3 The Option Prices Given by the SABR Model. 3.5 Qualitative Behaviour of the SABR Model. 3.6 The Link Between the Exponent, _, and the Volatility of Volatility, _. 3.7 Volatility Clustering in the (LMM)-SABR Model. 3.9 How Do We Know that the Market Has Chosen _ = 0:5? 3.10 The Problems with the SABR Model. 4.1 The Equations of Motion. 4.2 The Nature of the Stochasticity Introduced by Our Model. 4.3 A Simple Correlation Structure. 4.4 A More General Correlation Structure. 4.5 Observations on the Correlation Structure. 4.7 What We Mean by Time Homogeneity. 4.8 The Volatility Structure in Periods of Market Stress. 4.9 A More General Stochastic Volatility Dynamics. 4.10 Calculating the No-Arbitrage Drifts. 5 Calibrating the LMM-SABR model to Market Caplet Prices. 5.2 Choosing the Parameters of the Function, g (_), and the Initial. 5.3 Choosing the Parameters of the Function h(_. 5.4 Choosing the Exponent, _, and the Correlation, _SABR. 5.6 Calibration in Practice: Implications for the SABR Model. 5.7 Implications for Model Choice. 6. Calibrating the LMM-SABR model to Market Swaption Prices. 6.1 The Swaption Calibration Problem. 6.2 Swap Rate and Forward Rate Dynamics. 6.3 Approximating the Instantaneous Swap Rate Volatility, St.
6.4 Approximating the Initial Value of the Swap Rate Volatility, _0 (First Route. 6.5 Approximating _0 (Second Route and the Volatility of Volatility of the Swap Rate, V.
6.6 Approximating the Swap-Rate/Swap-Rate-Volatility Correlation, RSABR. 6.7 Approximating the Swap Rate Exponent, B. 6.9 Conclusions and Suggestions for Future Work. 6.10 Appendix: Derivation of Approximate Swap Rate Volatility. 6.11 Appendix: Derivation of Swap-Rate/Swap-Rate-Volatility Correlation, RSABR. 7. Calibrating the Correlation Structure. 7.1 Statement of the Problem. 7.2 Creating a Valid Model Matrix. 7.3 A Case Study: Calibration Using the Hypersphere Method. 7.4 Which Method Should One Choose? 8.1 Statement of the Empirical Problem. 8.2 What Do We know from the Literature? 8.4 Distributional Analysis and Its Limitations. 8.5 What Is the True Exponent _? 8.6 Appendix: Some Analytic Results. 9. Estimating the Volatility of the Forward Rates. 9.1 Expiry-Dependence of Volatility of Forward Rates. 9.3 Looking at the Normality of the Residuals. 9.4 Maximum-Likelihood and Variations on the Theme. 9.5 Information About the Volatility from the Options Market. 10. Estimating the Correlation Structure. 10.1 What We Are Trying To Do. 10.2 Some Results from Random Matrix Theory. 10.5 Signal and Noise in the Empirical Correlation Blocks. 10.6 What Does Random Matrix Theory Really Tell Us? 10.7 Calibrating the Correlation Matrices. 10.8 How Much Information Do the Proposed Models Retain? 11. Various Types of Hedging. 11.1 Statement of the Problem. 11.2 Three Types of Hedging. 11.4 First-Order Derivatives with Respect to the Underlyings. 11.5 Second-Order Derivatives with Respect to the Underlyings. 11.7 How Does the Model Know about Volga and Vanna? 11.8 Choice of Hedging Instrument. 12. Hedging Against Moves in the Forward Rate and in the Volatility. 12.1 Delta Hedging in the SABR-(LMM) Model. 12.2 Vega Hedging in the SABR-(LMM) Model. 13. (LMM)-SABR Hedging in Practice: Evidence from Market Data. 13.1 Purpose of this Chapter. 13.3 Hedging Results for the SABR Model. 13.4 Hedging Results for the LMM-SABR Model. 14. Hedging the Correlation Structure. 14.1 The Intuition Behind the Problem. 14.2 Hedging the Forward-Rate Block. 14.3 Hedging the Volatility-Rate Block. 14.4 Hedging the Forward-Rate/Volatility Block. 15. Hedging in Conditions of Market Stress. 15.1 Statement of the Problem. 15.6 Are We Getting Something for Nothing?